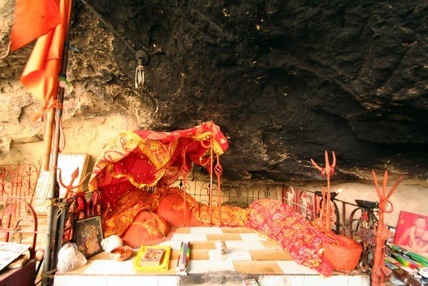 Originally the “temple” was on open cave and it is still the same way but some devotees, in recent times, now have built a tile floor, a door, and a bell. The priest welcomed me with Conch shell sound and ringing the bell. I am sure it was for welcome of Pujya Annaji who was with me in spirit and not for me. I was delighted to see the bell and rang it loudly for Mataji. As we started walking towards the Shrine a short man with “Hare Krishna, Hare Ram” scarf on his shirt came running to me (I was in Shorts and T-shirt and have no idea what made him zero on me out of all other members of the Offroaders club with me, who were in usual pants and shirts) and asked directly whether I was here to do prayers! Again it has to be my Guru doing this, otherwise I cannot explain why he would zero onto an American for prayers to perform when there were other natives with me. It turned out that he was the priest for the people who had come on the Volvo buses and had studied at well known Sola Vidyapeet (Sanskrit Vedic School) near Ahmedabad, Gujarat for seven years. It was as if Pujya Annaji, my Guru, had even arranged for a Brahmin for me to perform prayers! Considering what I was told by everyone in India and by my Pakistani friends that there is generally no one there, I cannot have any other explanation other than that my Guru had arranged all this for me. The priest showed us the way. 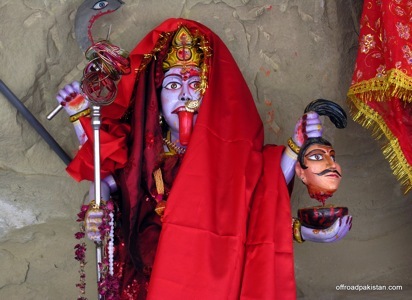 As we moved up the hill he showed us first the temple of Meldi Mata (popular in Gujarat) and then Kali Mata (Goddess Kali). I changed from my Shorts and T-shirt into a Shola (silk wrap around cloth) and took a dip in the water near Goddess Kali. I performed some prayers and then we moved upwards to the Shrine. Again there was a little pond (with very small fishes near the Shrine and I took a quick bath in it and entered the Shrine. I was asked to crawl with nothing on the body including any jewelry or glasses meaning totally naked or I must have a brand new cloth without any stitches! The dilemma was where to get the cloth that was never worn and had no stitches where there are no shops! I decided to crawl naked. I had no problem taking all my jewelry out and giving to the priest but I just could not take out my wedding ring no matter how hard I tried. I prayed to Mataji to accept this as if my dear wife Anu was coming in the tunnel with me also. As I was ready to be naked to crawl in the tunnel, I realized that the Shola that I was wearing, exactly met the specs, was brand new – never worn and no stitches! When I visited my Guru’s home first time in 1997 he had given me this brand new silk Shola which I had kept for all these years at his Gaddi (Alter) in our home. As I sat in the car to go to the airport for my flight to Karachi, somehow a voice called me and I ran back in the house and grabbed the silk Shola that my Guru had given me. It was brand new without any stitches in it and that is exactly what I was wearing – it is as if my Guru has planned this Pilgrimage for me in 1997 some 9 years ahead of my actual Pilgrimage! I was all prepared to go in the tunnel. As I entered the tunnel some of my Pakistani friends were not sure whether I should do this knowing that it was totally dark tunnel and it may take me 10-15 minutes or more to crawl in it and that there may be some poisonous snakes or spiders or both! Suffice to see that I was absolutely at peace with myself knowing that my Gurumata asked me to do this pilgrimage so she and my Guru were protecting me. And if a snake did bite me then I would have preferred to die in the lap of Hinglaj Mata instantaneously vs. suffering some cancer like illness in a hospital! No, I did not have the good luck to die in Her lap and I came out of the tunnel without any mishap. As I crawled in the tunnel, people outside kept saying “Jai Mataji” (Salutation to the Mother) and I would respond the same way assuring them that I was just fine. IS IT SEVEN OR IS IT FOURTEEN BIRTH‘S SINS? As I came out the priest told me to do a summersault (it was rather difficult for this tall and fat guy for sure!). He explained that this is a symbolic act signifying that I just came out of the Mother’s womb and that I have taken a new birth now wiping the sins of my last seven births. The experience was just divine. One of my Pakistani friends cracked a joke. He said, “Maharaj, you are mistaken; Jay’s sins of not seven but fourteen births have been wiped out.” The priest was clearly confused and slightly irritated and said that he has studied Shastras (Scriptures) and that it says seven years. My friend explained that since I came from America and I had the American passport and to get that passport I must have done enough Punya (good deeds) to wipe out the sins of seven births and hence seven births for the American passport and seven birth for going through Mataji’s womb makes fourteen births, isn’t it? I am sure that the priest was not very amused as I was. After this I got back all my jewelry and spectacles to wear. The priest gave me a special necklace made from some shrubs in the area with its own legend tied to Lord Ram. I was told to wear till I die and it should burn with my body and not be taken out. Soon I was led in front of Mataji and Bhairav’s Shaligram. I was just in tears of joy to be in front of Her. The peace and happiness that I experienced cannot be described in words. You must have the faith to experience this bliss. The priest prepared a small fire pit and asked me to put the Bangels and Chundadi on Mataji and put the 10 Kg of dry fruit and 2.5 Kg of Sindur as Prasad. He was about to start his prayers and I requested that I would rather prefer to do the prayers that we do at my Guru’s place if he did not object. He was kind enough to light the lamps for me to do prayers in my way. I was just overjoyed to do the prayers. There was a person in the Volvo group who is a protocol person at the Karachi airport and he was kind enough to take the movie of my experience at the Shrine. He was so nice that even though he had a day off from his duty he showed up at the airport, waiting for me to whisk me through the formality of immigration and customs, when I left for Mumbai a day after. Again I consider this as my Guru taking care of me. If I get the blessing and permission I would like to go again and not only redo this pilgrimage but do the pilgrimage of another Shakti Peetha in Pakistan same distance from Karachi in opposite direction near the famous Moen-Jo-Daro excavation and Katas Raj temple of Lord Shiva. Mahera (Hamid Omar’s daughter) has made a documentary of my pilgrimage and someday I will be able to see that after she gets time to do editing in her busy NGO work of saving animals from cruelty in Pakistan. She has done lot of work to help animals who suffered in the recent massive flood in Pakistan in 2010. She recently successfully appealed publicly NOT to slaughter goats on Bakra-Eid and instead donate funds to buy goats to be given to the severely flood stricken families who lost their animals and provide them with milk and livelihood – something worth doing across the Muslim world. The Offroaders Club members have adopted several villages affected by this massive flood and have set up tent cities, food supplies, medical help, medical clinic and a pediatric hospital. As you complete reading this article I will appeal and urge you to donate funds to their humanitarian cause. [As always, click on individual image to see full size]. 1. 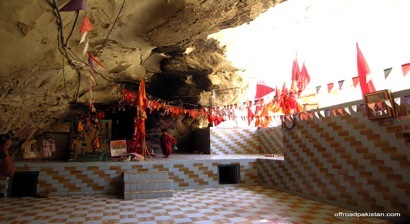 Hinglaj, the Hindu holy shrine in Hingol, Balochistan 2. Traveling through Pakistan – The Katas Raj Temple 3. KATAS – A Paradise Lost and a Paradise Regained!